X-Men Forever #1 Review: Eighteen Years Too Late? Hey, everyone… Here is my second review for the week. I will be doing at least three so expect to see them each day for the rest of the week. Hope you enjoy. RECAP: The issue opens with Jean daydreaming about kissing Logan. In reality the X-Men are in the Blackbird trying to hunt down Fabian Cortez after his destruction of Magneto. 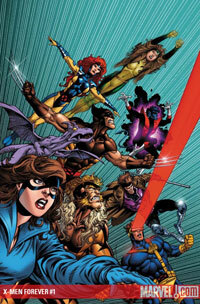 Wolverine, Scott, Jean, Kitty, Gambit, Nightcrawler and Lockheed are riding while Rogue and Storm are flying alongside. Beast and the Professor are monitoring them from the mansion with Nick Fury supervising. It does not take long for the jet to be shot out of the air. Nightcrawler teleports Scott and Gambit to safety while Kitty grabs Wolverine and Jean and phases them to be lighter then air to escape the jet. Storm and Rogue move to confront their attacker but he manages to sneak up on Scott, Gambit and Nightcrawler first. Fabian enhances Cyclops optic beam and uses it to blast Gambit and Nightcrawler before blasting the still airborne Wolverine. Jean intercepts the next beam while Kitty and Logan fall to the ground. Rogue swoops in to attack Cortez but he is able drain her energy then tears her costume and uses Rogue’s ability to take out Storm as well. We have a quick flash to the mansion where all contact has been lost. Fury offers to send SHIELD but Xavier knows it will be too late by the time they could arrive. Scott, Gambit, and Nightcrawler start to recover but Rogue and Storm are still down. Scott has lost his visor and is essentially blind. Cortez shows up and attacks Wolverine, draining his strength. Kitty tries to intercede but is caught in the attack. Jean uses her power and when Cortez tries to counter she manifests the Phoenix. He tries to run but is taken down by the coordinated attack of Nightcrawler and Gambit. Logan wants to kill him and Gambit agrees but Cyclops stops them insisting on turning Cortez over to the authorities. SHIELD arrives and transports the mutants back to the mansion. Fury informs them they are going to be closely watched from here on by him. Wolverine stalks out. The issue ends with another take on the scene from Alpha with Logan being killed this time from Jean’s perspective. MY TAKE: I can see that this comic and most likely this whole series is going to be highly divisive. I have been dwelling on it since yesterday and I am still not sure where I fall. It will probably take a few issues to get a good enough feel for the comic and make a true judgment. On the plus side, Claremont is back in his comfort zone with these characters. He does know them well and all of their dialogue feels right. Well with the possible exception of Jean and Logan’s interactions but we will get to that later. I personally like the talk heavy style with the thought bubbles so it was good to see it. The story is simple and we have seen it all many times before so it felt familiar if a bit over done. But it was very hard for me to simply let go the past eighteen years of stories. I kept thinking, Cortez can not do that, he is a wimp! But of course as of this point we know nothing much about him so he could have been developed that way, he just was not. My biggest plot issues were twofold. First I do not understand why Kitty and Kurt suddenly appear. At this point they were very firmly embedded in Excalibur and there was no explanation on the sudden change of heart. Claremont obviously has his favorites but I do not understand skipping characters like Betsy and Forge that were present in the first arc to put new people in the mix. Secondly, the sudden Logan and Jean romance was completely out of left field and only seemed to be present to give Logan’s death more impact. Outside of a few moments in crossovers there has not been a hint of romance and suddenly they are in full blown love? I do not understand it and I love the idea of them as a couple. This series was supposedly a continuation of Claremont’s plot ideas but from what I have read and seen posted, this is not the case. While Wolverine’s death seemed to be well planned, it is being done differently and the cast has seemingly changed. That does not mean the stories will be bad, I am just curious as to why we are being told one thing and shown another. Either way I am still keeping an open mind. Read alone, this issue was not bad although it was not amazing or groundbreaking. It remains to be seen if Claremont can overcome the baggage and deliver original and entertaining stories. Thanks for reading my review for Wolverine Files. I will be keeping to this format for the most part but please keep the comments coming and I will see everyone again tomorrow. 3 Comments on "X-Men Forever #1 Review: Eighteen Years Too Late?" I just hope he doesn’t stay dead, no matter what the evidence is saying right now . . . . While the evidence and interviews so far do not look good for resurrection, I know Claremont’s original plans for the series included Wolverine’s death and his return as a villain. Including his getting Jean for a while. It seems odd that he would so heavily emphasize the potential love between Logan and Jean if he was going to permanently kill Logan at the end of the issue. Claremont likes to build story lines so here is hoping we see the little hairball again.